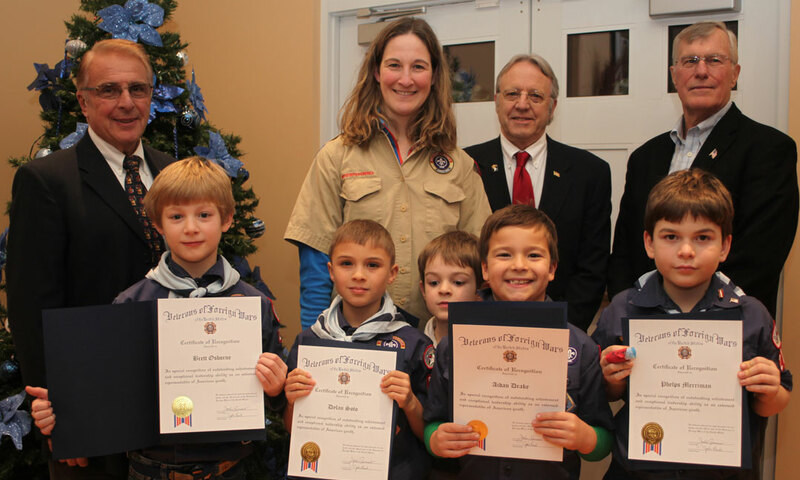 (Pictured) Members of Cub Scout Den 11, of Boy Scout Pack 276 in Simsbury, Conn., were recognized for donating $486 to the Post’s Adopt-a-Vet program. The four Cub Scouts, in the front row, responsible for the donation are: (from left to right) Brett Osborne, Dylan Soto, Aiden Drake and Phelps Merriman. Caleb Deems, who is missing from the photo, also participated. Those in the back row are: (from left to right) Post Commander John Romano; Den Leader Suzanne Osborne; her son, Josh; Post Quartermaster John Lamb; and Senior-Vice Commander John Fox.